The large wide spiralling horns of a male kudu make it easy to identify. The horns have become an iconic symbol, even used on the South African National Parks (SANParks) logo. Their design inspired the ‘Kuduzela’ a kudu horn shaped vuvuzela that became a popular feature in the 2010 Soccer World Cup. Only males have horns and while the large horns are certainly impressive they are not always ideal for combat. Their horns have been known for locking and causing animals to struggle to free themselves when fighting. The very impressive spiral horns of a kudu bull seen on a rainy day at Londolozi. Photograph by Phil Judd. A kudu bull moves through an open clearing. Photograph by Mike Sutherland. Related: Bushbuck and nyala are closely related to the kudu and all belong to the Tragelaphus family and also sport a spiral shaped crown. Their horns however are much smaller than the majestic horns of a kudu bull. Unlike most animals the horns of buffalo and wildebeest grow outwards forming two mighty hooks on either side of their head. 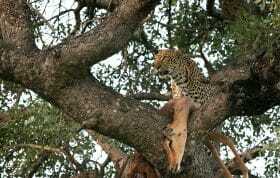 The hooks make an excellent defense especially against predators such as lions. You may have seen video footage of buffalos that have used their hooks to fling lions into the air, protecting the members of their herd. Under threat, buffalos group together to form a protective shield to ward off and intimidate the opposition. 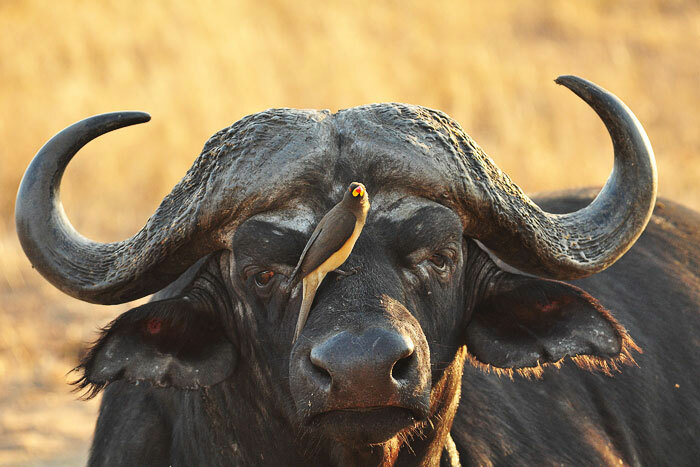 Two yellow-billed oxpeckers perch on the crown of a buffalo. Photograph by Mike Sutherland. Distinguishing features: The horns rise from heavy bosses and spread out and downwards, curving up and inwards with a sharp hook at the edge. 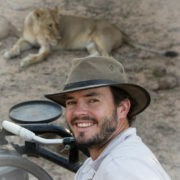 Click here to watch an incredible YouTube video of a buffalo and lion fight. Impalas are a common resident of the bushveld and live in abundance at Londolozi. Skittish animals, they are always on the look out for potential threats and move in herds as a form of protection. Horns are only found on males. Other antelope with twisted horns include the springbok, reedbuck, hartebeest, bontebok and blesbok. At the beginning of winter as the days get shorter and the nights longer, impalas start to rut. This is when the impala rams’ testosterone levels skyrocket causing them to fight for territory and dominance over females. 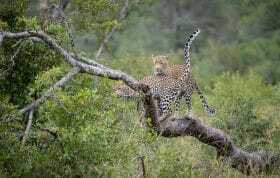 The loud almost barking sound can be heard as it reverberates across the bushveld. It’s not uncommon to see impala rams locking horns as they compete between one another. 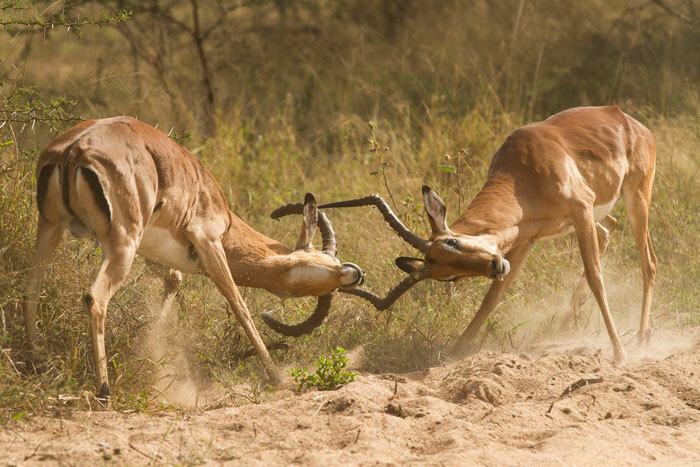 Two impala rams lock horns in a particularly violent contest. Photograph by James Tyrrell. 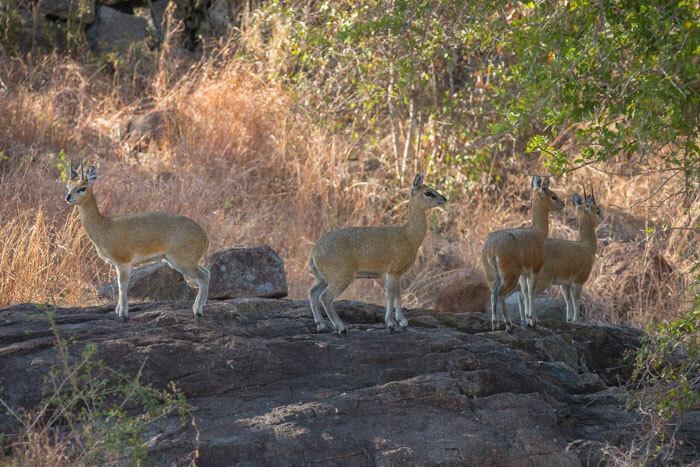 The short straight spikes of a klipspringer, duiker, grysbok and oribi are no match to their fellow antelope but while they may look like they would have little effect in a fight, the antelope use these to defend territory and keep intruders out. Both males and females use their horns for this purpose although the female grey duiker is an exception having no horns. The spiked horns of a klipspringer can be seen clearly in this photograph. Photograph by James Tyrrell. The horns of a waterbuck are curved and point upwards. Horns are only found on male waterbuck. This curve is also very distinctive in the shape of the horns of a gemsbok. We don’t find gemsbok at Londolozi but the long horns are an unmistakable feature of the Kgalagadi where they live in abundance. 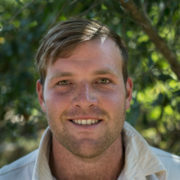 Distinguishing features: Waterbuck horns are long and ridged, sweeping outwards and slightly back in a wide arc formation. 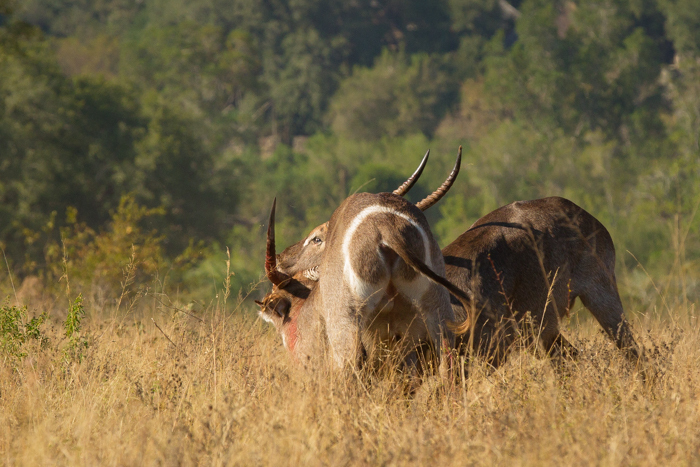 Blood on the neck of one of these waterbuck emphasises just how serious – and potentially deadly – their fight was. This was actually taken on foot when we had stopped for coffee one morning. The clash of horns alerted us to what was going on. Fortunately one of the Waterbuck backed down and ran off, with the other one in hot pursuit. Photograph by James Tyrrell. Photographed by: James Tyrrell, Mike Sutherland, Talley Smith and Phil Judd. Which of these horns to you most admire and why? Share your thoughts with us below. 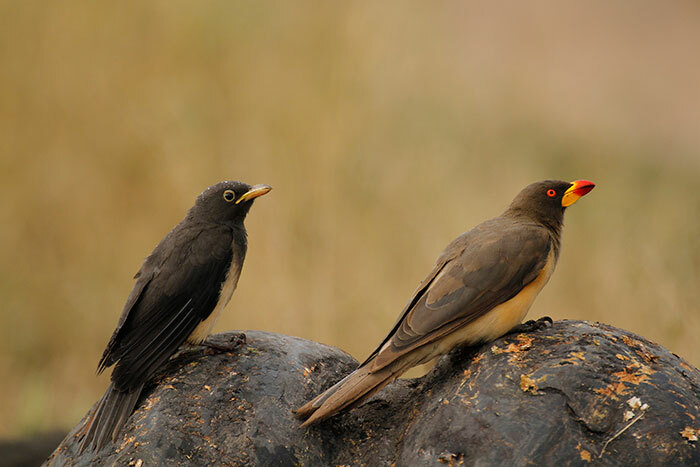 Thank you Marinda, lovely to have the oxpeckers with us! Great pictures & info. Kudu horns are especially fascinating. 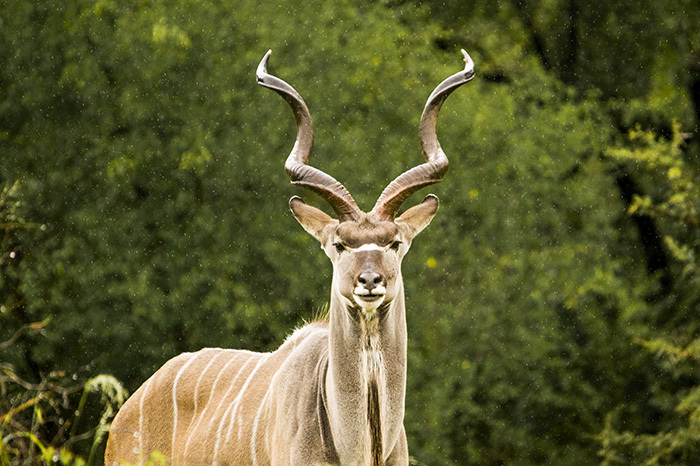 Love the pictures, especially of the kudu bull captured in the rain by Phil. Interesting write up Kate! I think the Kudu horns are most impressive. 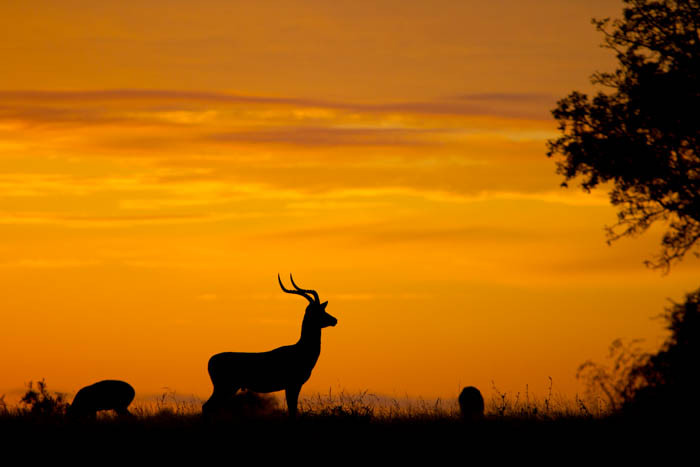 All the photos are fantastic as well and I especially love the colours in Mike’s photo of the Impala in the morning light…very beautiful. 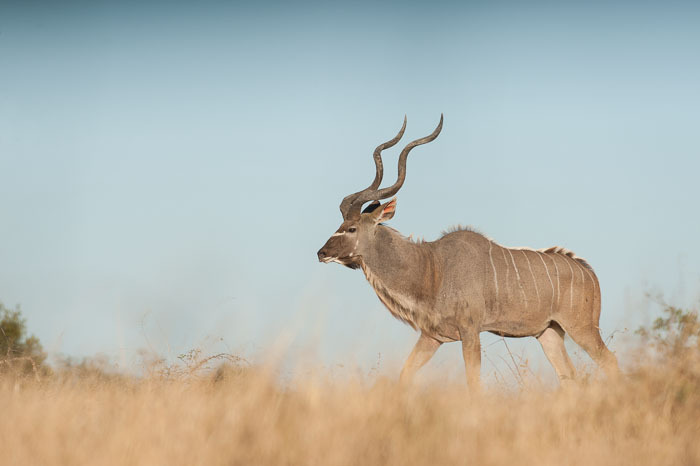 Thank you Jill, I enjoyed researching this article and I must say I agree that the Kudu horns are definitely very impressive. I love the Kudu, they maybe one of my favorite animals. 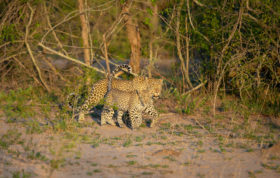 And, it just goes to show, there is a reason for everything…I’m amazed at the new things I learn reading this blog, as well as the trips I make to Londolozi! Thank you! I agree with everyone that the Kudu is most spectacular. However, I would not want to be anywhere near the buffalo horns (outside a vehicle). This was great, I learned a lot about different antelope. What a great, informative blog Kate. Thanks for sharing. The picture of the kudu in the rain is brilliant!